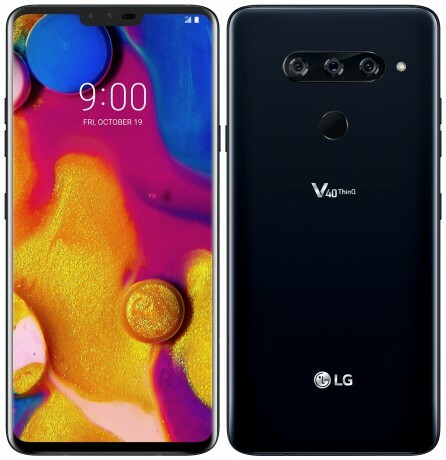 LG today fully revealed the V40 ThinQ, its camera-focused flagship phone for the remainder of the year. The V40 adopts five cameras, with three on the back and two on front. The rear cameras include wide-angle (16mp, f/1.9), normal (12mp, f/1.5), and telephoto (12mp, f/2.4) lenses to offer people greater flexibility in capturing images. Using the new Triple Shot tool, the V40 can take pictures with all three lenses and then merge the result into a shareable GIF with zooming animations. The front of the phone features an 8-megapixel normal lens and a 5-megapixel wide-angle lens for selfies. Both front and rear cameras support portrait/bokeh photography. The V40 has a 6.4-inch AMOLED display with a notch and quad HD+ resolution. The phone is powered by a Snapdragon 845 processor with 6 GB of RAM and 64 GB of storage. Other hardware features include support for microSD storage cards, 3.5mm headphone jack with quad DAC, USB-C, and a 3,300mAh battery. The device offers rapid charging and rapid wireless charging. Wireless radios include Bluetooth, FM, GPS, NFC, WiFi, and LTE with most U.S. bands on board. The V40 is made from metal and glass, with 2.5D glass on front and sand-blasted glass on the rear. The phone is rated IP68 for protection against dust and water. The V40 runs Android 8.1 Oreo with a number of software features provided by LG. The V40 will be available for preorder starting today, with in-store availability scheduled for October 18. Raw pricing for the device is as follows: AT&T, TBD; Sprint, $960; T-Mobile, $920; U.S. Cellular, $900; and Verizon, $980. Each carrier will have its own monthly rates and bundles available at launch.